Cabinet Secretary Leoncio B. Evasco Jr. and Agriculture Secretary Emmanuel F. Piñol are in agreement that the best way to stabilize the supply and cost of rice in the market—instead of importing—is to increase the government’s buying price for palay despite its impact on inflation. With this, Evasco called on his fellow Cabinet officials at the policy-making the National Food Authority Council (NFAC) to reconsider the proposal of the National Food Authority (NFA) to increase the government palay-buying price, from the current P17 per kilogram (kg). Economic managers—particularly the heads of National Economic and Development Authority (Neda), Department of Finance and Central Bank—within thet NFAC earlier thumbed down the proposal to increase the NFA’s buying price of palay, as it would result in faster inflation, Evasco revealed. The NFAC is the highest policymaking body of the NFA. “The moment you increase the buying price of palay, it opens the floodgate for inflation on all commodities. That was the contention of the economic team within the council, who would go against the advice of the economic [team]?” he told reporters in a news briefing in Manila on Monday. “At any rate, We ask Neda to again review, the meat, the substance, of the study of the research done before so that we can come up with adjustments if there is really a need to adjust the buying price of palay from the local farmers,” Evasco added. The NFA said it was unable to meet its paddy procurement target last year as traders bought rice from local farmers at P18 to P20 per kg, higher than its buying price of P17 per kg. The food agency had earlier asked the NFAC to increase it to P22 per kg. The food agency gives an additional incentive of P0.20 to 0.50 per kg for delivery, P0.20 per kg for drying and P0.30 for cooperative development incentive fund for farmers’ organizations. Last year the chief of the Department of Agriculture pushed for an increase of P3 per kg in the support price of the NFA so more farmers would be encouraged to sell their crop to the government. “Today the buying price of traders for fresh palay from the farm is around P19 to P19.50 per kg. And if it is clean and dry, it is more than P20, around P20 to P24 per kg,” he added. Southern Leyte Rep. Roger G. Mercado also threw his support behind the increase in the buying price of palay. Mercado said NFA should be allowed to buy paddy at P20 to P25 per kg. 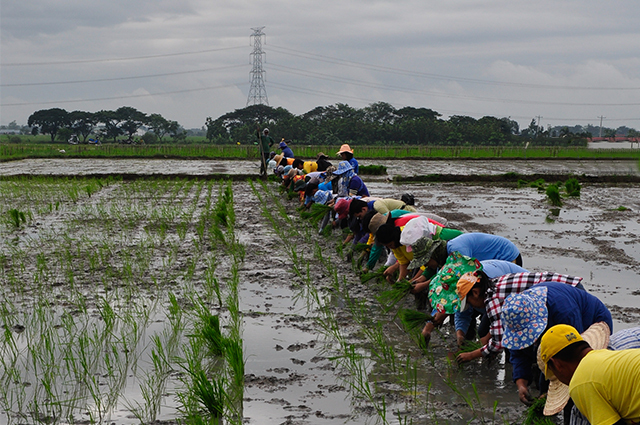 He added the NFA should also increase its rice incentives, so local farmers “would immediately and directly benefit” in the form of higher earnings. “Instead of importing rice, the NFA should buy its buffer stocks from Mindanao or the Visayas to augment NFA inventories in its warehouses in Mindanao and the Visayas,” Mercado added. The NFA, an agency attached to the Office of the President, is mandated to ensure national food security and stabilize supply and prices of staple cereals both in the farm and consumer levels. The food agency buys paddy from farmers not only to stabilize farm-gate prices but also to boost its stockpile. The NFA also imports rice if local procurement fails to augment its buffer stock. Evasco announced on Monday that the NFAC has green lighted the NFA’s purchase of 250,000 metric tons (MT) of imported rice via the “government-to-private” (G2P) scheme. The government’s purchase of rice through the G2P scheme is covered by Republic Act 9184, or the Government Procurement Reform Act, which provides that the lowest bidder would be named as supplier. The volume is expected to arrive in the country by June, to avoid coinciding with the harvest of rice as this could cause farm-gate prices to fall drastically. Economist Pablito M. Villegas said the decision of the NFAC to opt for the G2P procurement scheme could hurt millions of Filipinos who depend on government-subsidized rice. “The [NFAC] should have opted for a govern-ment-to-government scheme. The government is employing a regular procurement scheme for an emergency situation,” Villegas said. Evasco, however, said there is no urgent need for the government to buy imported rice as the national inventory is currently at 3.8 million metric tons (MMT), which could last for 121 days. “Again, we would like to assure the public that the NFAC is on top of this situation. We will ensure the continued supply of affordable rice and continue to champion for the best interest of the Filipino people,” he said. Evasco called on the NFA to inspect all the warehouses of private rice traders to prevent them from hoarding and creating an artificial shortage of the staple. “NFA should be proactive in monitoring the warehouses of private traders, because you know private traders will always go for high prices at the expense of the buying public. So the NFA should be proactive in monitoring these warehouses,” he said. “Part of the NFA’s job is to inspect rice warehouses. And if traders are found to be hoarding rice, then they should prosecute and arrest them,” Evasco added.